Is it possible to have a Happiness Hangover? If so, I’m almost 72 hours into one of epic proportion. Some of you might be looking for a proper review of that little show I spoke about with anticipatory giddiness a few days back. That had been the plan, but then my bud Len threw a little something together describing the first three shows of the tour and there’s just no way I can come close to topping his take on the wonderment. If you want the playlists and a bang-up overview of his enthusiastic take on the tour-to-end-all tours, please pop over and visit him at Battery Kill Corner. You won’t be disappointed. The guy knows his way around music like no one else. I don’t claim to be a reviewer (let alone one of Len’s caliber). I tend to be a little more (shall we say) stylistically informal (at least when I’m not doing the day job) than is traditionally called for when reviewing books or concerts or what-have-you. I also don’t love reviews (generally speaking). I prefer to form my own opinions about things- uncluttered by the responses that others might have had. I read one post-show review in a local source and was incredibly disappointed by the writer’s lack of real engagement with the artists and their ability to hold the crowd so tightly together. I guess I want everyone to have had the same experience I did. What I do write is a whole lot o’ letters (especially when I’m doing the day job), and figure I’m pretty good at that sort of thing. So let’s not call this a review. Let’s call this a thank you epistle. A reallyreally loooong thank you epistle. Back when we were youngsters, Mum insisted we learn to write proper letters of gratitude and acknowledgement when people took the time to gift us with something- be it a material offering or a granting of time and attention. Much as we grumbled and tried to get out of it, the lesson- and habit- was one that stuck with me. It seems to be a rapidly-disappearing social nicety, so here’s my stab at changing that. From cole davidson, the pseudonymous blogging handle of a citizen of Toronto the Good, grateful lover of music, to the assembly of musicians and supporters who collectively demonstrated the wonder of our shared humanity at Kool Haus on Tuesday, August 26, 2014. I am thankful for your presence in the world- for the songs and the wisdom and the fun that you have shared across decades and in far-reaching places. I thank you for returning, one and all, to this city that loves you- a congregation that has hosted you before and that will continue to welcome you whenever you choose to return. First, though, an apology. I admit that I was somewhat less than enthusiastic about the inclusion of Katrina (ex-of the Waves) Leskanich in the tour de force that is Retro Futura. I never looked beyond Walking on Sunshine (which was, let’s be honest, somewhat overplayed- back in the day and on retro radio stations in more recent times). I’m also (as I’ve mentioned before) not big on the girl singers. I admit this. So I was pretty blown away by just how hard that lady can rock and roll. I’m not sure just what was up with Gary and the caftan (although Len says they had a convo about that- something to do with keeping cool and hiding his middle-aged paunch- but that’s just hearsay), but he and Eddie (who, as Gary quipped, “still wears the pants”) came on out and chatted with us all as if we were hanging in the living room. Or at Hugh’s Room. A show which was referenced when he asked who among us had been with them there. They included the song that really started it all for them- their 1982 tune about the insidious evil of Apartheid in African and White. I’m not sure I understand why they left Working With Fire and Steel off the playlist this time out, but the inclusion of Arizona Sky made me happy. It had fallen off the Shuffle Daemon’s playlist. It’s back again. Forgot how much I loved it- and love seeing them do it live (last time would have been at Canada’s Wonderland in ’80-something). Mr. James Ure. (Can I call you James? During one of our many discussions/debriefs about the shows, I mentioned something in passing about Jim Ure- to which Len remarked that there are probably only about 114 people in the world who know that ‘Midge’ is a nickname stemming from the reversal of ‘Jim’). It almost made me forgive him for not playing Reap the Wild Wind– my absolute fave Ultravox song- and one of my fave songs of all time full stop. But he played Vienna… and Fade to Grey… and If I Was. So much greatness. Jim ended his fierce set with Dancing With Tears in My Eyes (probably his best known hit- after that little Xmas song, of course)- a song full of the haunting echoes of that era- and my generation. We were the children of a time period in which 3-or-4-minutes-to-midnight was an ever-present reality. We felt the shadow of nuclear destruction in all facets of our life. There were constant warnings that the clock was ticking down- that two old men had their fingers hovering over buttons that could end the world as we knew it (my thanks to Nik Kershaw- who would have fit right in among this august company- for that particular image). We were an apocalyptic generation (and we’re still feeling that ennui and uncertainty ripple through the subsequent years). The Canadian War Museum in Ottawa has (had? Haven’t been in a few years) a section that deals with the years of the Cold War. In the early 80s, as Reagan escalated the arms race and advocated the positioning of guns in the sky to keep democracy safe from the Soviets, the music reflected the reality that the Doomsday Clock had us teetering dangerously close to the edge of a politically-driven global catastrophe. That video still makes me shiver with remembered fear that goes bone-deep. In its sadness and desperation as the end comes with the meltdown at a nuclear power plant there is still a love of life and the transcendence of inevitability that wends its way through all of Midge’s songs. And then there was Howard. I admit that I spent some time trying my hand at being one of the cynical few– a member of the Doom Crew, if you will. Part of growing up is getting all angsty, all ‘the world is against me’, all ‘nothing can save us now’ about things. I like to think that I left that negativity behind me a long time ago (teenage angst is highly unattractive in people no longer teenaged), but, things in the world as they are, I have been feeling a creeping return of negativity, and overall frustration with the unwillingness of people to critically assess situations and work toward affecting positive change. Leading up to Tuesday night, listening to Howard again, the reasons why he is a man to admire and to emulate came through loudly and clearly. And I realized that he played a pretty big role in helping to shape the way I approach the world- as an adult, now, but also as a young’un seeking a path in the world. His voice is all about the positive. That New Song of his spoke volumes to me as a 13-year-old. It resonates even more now. He taught me that it was okay- nay, that it was necessary, to question things and to look for, and then thoroughly evaluate, the answers that we find. In songs of less than five minutes. He taught me that. And this. And maybe love is letting people be just what they want to be, the door always must be left unlocked. To love when circumstance may lead someone away from you, and not to spend the time just doubting. He seemed genuinely happy to be back with us- he even referenced the fact that he was Canadian for a time (and can sing the National Anthem with the rest/best of us). These songs… All of these songs… This one hit me right where I’m living right now. If you hang out with me hereabouts you know that I’m in the process of thinking through and working out the ways in which I can translate my particular view of the world in a way that can be shared vis-à-vis the corporate realm and the larger community. That song sums up so manymany things for me. And man, does it make you smile. I DARE you not to smile as you listen to that song. I didn’t want him to leave us. Tom Bailey. I spoke about my sentimental connection with the Thompson Twins- about Dad, and 30 years, and how the nostalgia is, in itself, healing. But the reality? Whoa back. As soon as he took the stage he led us in a conversation– starting with some needed filler to cover for a technical glitch at the get-go. Tom chatted with us as the issue was resolved- talking about his appearance on Jimmy Fallon- how weird that was since he’s not one for the ‘show business’ stuff. He strolled the stage- looking comfortable and extending random thoughts and off-hand comments until the machines were up and running again. That song I spoke about the other day- You Take Me Up– was one more in a string of sing-a-long opportunities over the 4 hours we were all together. His updated version of a song from a movie that was part of the canon of 80s teendom got everyone remembering (those who were behind the curve) what it was like to be 16. After more than a quarter century not performing (or even listening to) these songs, it was pretty remarkable how comfortable he was on that stage and with those words- that are ingrained in my memory- as he made the whole shebang look effortless. I loved Lies, missed Lay Your Hands on Me– although I understand his reasons for leaving that one off the playlist- and rediscovered my appreciation of King for a Day. And then it was time. When I was 14- and on that road trip with the family that I told you about, listening to the tape over and over and over again- every time I heard that song I had the visual of the video that was getting tonnes of airplay on the video shows back home, with Tom, redheaded and at the piano, belting out a song of love. A love song that acknowledges that all is not always long-stemmed roses and boxes of chocolates. That communication is vital- but that misunderstandings will happen, nevertheless. While on the Walt Disney World portion of the road trip, we spent an evening at what was then Lake Buena Vista Village (before its Downtown Disney iteration). As the lake lit up and my folks and sisters moved in and out of the stores, I stood on the shore of that lake, Walkman in pocket, listening to Hold Me Now, and just being almost-14 and in love with Tom Bailey. 4 years ago, after an emotionally brutal divorce and challenging upheaval and relocation home to TO, Dad and my sisters sent me to Disney for my 40th birthday. One evening, as my sister slept, I went out for a walk down by another of the Disney lakes. This one, looking across at a Magical Kingdom, had a beach that was completely deserted at that time of night. I popped in the ear buds and chose the last song of the night on the Shuffle Daemon. I remembered being almost-14 and in love, feeling the intensity of that adolescent emotion, while I counted my blessings and drifted back into that innocent affection for the duration of the song. Mr. Jones’ Everlasting Love, indeed. In an interview with Ryan White in the Sacramento Bee, talking about why he chose, after 27 years, to return to playing and touring with these songs of my youth, Tom reflected on what those songs were all about. “I kind of suddenly grasped it was about a nostalgia for a lost honesty about ourselves and about our optimism for the future.” Bailey said. When he thinks about the 80s, he thinks about that optimism, and the way the years since have been marked by disappointing and discouraging events. In some respects, cynicism has been normalized. “I feel like it would be a contribution to lift the lid on that 80s optimism.” And that is the work of a pop star. And a man with things yet to teach. Every one of the great and talented performers that gifted us with their presence on Tuesday has mastered effective communication to a degree that is staggering. They are still imparting lessons. Especially resonant for me is the one that says that a ‘classroom’ needn’t be bricks and mortar and organized within an institution of some kind. That those who are meant to teach will always find their audience and impact the lives of others as they both entertain and advise. Epistles are letters that, traditionally, are didactic in nature. The epistolary genre was common in Ancient Egypt and made up a big part of the curriculum found in scribal schools. It became a major type of composition among the Greeks and Romans before it found an even greater degree of fame in the hands of that guy from Tarsus and those who later wrote in his name and/or style. Philosophically, didacticism emphasized the instructional qualities of art and literature. And music. Epistles also told stories of love and devotion while modeling behaviour and recommending effective and productive and human and humane ways of living in this world of ours. So. Thank you for the songs. For the lessons. For the examples. For continuing to teach me about life and love and positivity. And for coming to see us again. On my birthday. This greeting and fulsome (understatement, that) record of thanks and enduring love and appreciation is by me, cole, by my own hands, on my own keyboard. My appreciation to all of you, In the Name of Love. Verily. It’s been a long, dispiriting couple of weeks in manymany ways. The news isn’t good (understatement, that)- and seems to be growing ever darker. My last post– and the direction in which my mind has been traveling the past little bit- has tended toward the apocalyptic- which is, in its current parlance, foreboding and pessimistic by definition. But it’s hard to hold onto the doom and gloom- on a gorgeous Friday in TO, with the CNE open and heralding the end of summer, people heading to a baseball game, and a festival of street performers bringing crowds of people together to celebrate community and creativity. Soooo- I’m going to set aside all that ‘end of days’ chatter and focus on the present- and the joy of the past that have helped to get me here, to this place, right now. Last week I wrote about the loooooong car trips we used to take as a family when we were kids. As I mentioned, I pulled out all kinds of crazy stops to keep the sisters (and myself) entertained in those days loooooong before anyone thought to put a movie-watching machine in a moving vehicle. To give themselves some peace and quiet from the ongoing silliness prompted by that alien from outer space, my parents let us take it in turns to control the tape deck (yes, we had a tape deck- at least it wasn’t an 8-track player). In the summer of 1984, home from camp and on the road to see every freakin’ fort on the Eastern Seaboard, my go-to and oft-repeated choice was an album called Into the Gap by a British band called the Thompson Twins. I loved that tape. By the end of the holiday my sisters and I could sing along with all of the songs. Once home, along with the usual gearing up for the start of a new school year, my parents had to contend with my end-of-the-summer birthday. They asked what I wanted as a gift, and my answer was something that could be easily accommodated (the way my 14-year-old self saw the world, anyway). The Thompson Twins were playing the Grandstand at the CNE two days before my birthday. Perfect, thought I. The parents? Not so much. For some reason they had an issue with their 13-year-old (those two days meant much more to them than they did to me, apparently) heading to the Ex all by myownself for a concert (that wouldn’t end before 11pm). But they knew I reallyreallyreally wanted to go (TBH, my constant expression of this fact might have had something to do with that awareness). So… the compromise. Dad, wonderful man that he was, opted to get us tickets and take me to see the band. It. Was. Awesome. The initial pangs of embarrassment I might have felt about going to a concert with my Dad faded pretty quickly as I stood, enraptured, as the band took the crowd through their songs of wonder. There were more, and I’ll likely talk some more about the rest of them (placeholder), but this one- and its video (which I hadn’t seen in decades before I went looking for it this week) is super-resonant with the directions in which my brains is running right now. There’s hope in your eyes – hope in his eyes. ‘Cause this love never dies – love never dies. It’s better that way and you work through the night. to work hard on machines. That concert, 3o years ago this weekend, is one of my happiest memories. Not just because of the great music, but because of the time I got to spend with Dad. He enjoyed the show a great deal- and watching him watch the band and feeling the energy of the crowd started to bring home the fact of his person-ness- as opposed to his Dad-ness. At least a little. While he would always retain his Dad-ness, that show help to set us on the road to the friendship that we would develop as I grew up- a relationship that remains one of the great privileges of life filled with good fortune. Fast forward a number of decades to the end of a difficult Spring and an email message from an oldold friend. He isn’t exactly the Boy Next Door, but he comes pretty close. Len and I grew up a block away from each other- went to Kindergarden and onwards together, and then, as happens, lost touch for a decade or two. Through the miracle of social media (mixed blessing though it may be), we reconnected via the facebook a number of years back and discovered a shared love of music and common ways of approaching all kinds of things in this here world. A few months back, Len, with his connections to the world of music, heard the first inkling regarding a concert that was in the works. A show that would bring together a passel of the great voices of the 80s and have them share a stage of an evening. Ultimate result? That up there ^^^^. As coincidence (or providence, or fate, or whatever) would have it, they’re stopping here in town. Almost 30 years to the day that I last saw Tom Bailey perform those songs, with my Dad at my side. It should go without saying that I will be in attendance. Now Len, being an even bigger fan than I, is seeing them three times (yes THREE) before the tour hits our hometown. He was at opening night in NYC and is at tonight’s show as I write this. I’m putting aside my jealousy (and absurd degree of eager anticipation) in gratitude that I will be experiencing it all for myself in just a few days. But it’s hard. The line-up is phenomenal- a musical journey down memory lane that I can’t wait to experience in person. So I’m getting into the proper mindset by running through the old faves and re-familiarizing myself with some gems that the Shuffle Daemon and I have neglected recently. I did see these guys, live and in person, last Fall. I wrote about that show (although the post won’t link for some reason- search on ‘Persuasive Danger’ if you’re interested in giving it a read)- and the fact that it felt like hanging with old buds seeing them at Hugh’s Room. I have written about this guy before, too. Quite some time before Alanis so spectacularly misused the concept of ‘irony’, an English dude named Howard wrote this little ditty about expectations not always meeting the reality. Howard also requires a placeholder. Bigtime. I’ve seen him live a few times over the years and he never fails to disappoint. Revisiting his catalogue over the past little bit has reinforced the reality that strong musical ability and intelligent (and positive) lyrics can still have popular appeal. I could write dissertations on his turns of phrase and clever use of language (okay, that might be slightly hyperbolic. I’m a little overexcited right now) and he deserves more than a bare paragraph here. Rather than drive myself (and those around me) completely nutso with my jittery anticipation, I’ll be spending the next few days catching up with these old friends in advance of hanging out with them next week. Their tunes- and the memories they provoke and the messages that still shout their wisdom- will be the backdrop to my weekend. But I’ll still be counting down the hours… and thinking back over the years. The other day I briefly referenced the fact that I’ve been thinking a whole lot about apocalyptic thinking- particularly in the context of the workplace. A sizable portion of the reading I’ve been doing lately has to do with the development of positive corporate culture- a mixed bag of approaches to the office environment in the midst of changing realities in the wider cultural/societal environment. So many of the concepts I’ve been reading about have one thing in common. Whether they use the specific terminology or not, they are advocating the eradication of apocalyptic thinking. I’m in the process of trying to pull some of these ideas together- and add my own particular voice and perspective to the discourse. Doing so involves some definition of terms and exploration of apocalypticism- as both a body of mythological literature and a worldview. I love the literature. GREAT stories- some memorable and colourful characters that persist in holding our imaginations. As an ideology? Not so much. The nature of apocalyptic worldviews lies at the heart of a boatload of our social, cultural, political and just plain ol’ human problems. That these issues lead to problems in the workplace is, to me, a logical extension of the fact that we inherit and adopt ideologies without necessarily being aware that we have done so. I wrote this post over a year ago. It serves as something of an introduction to apocalypticism (as does the previous post that is linked in this one) and begins an approach to getting my thoughts on the connection of end-of-world thinking and general (and, by extension, workplace) dissatisfaction. The Eschaton. The End of Days. It seems to be everywhere lately. There are television shows, movies, books and seemingly constant news articles about various ways in which society as we know it might be brought, abruptly, to a problematic conclusion. There are viruses, plagues, earthquakes, aliens, and, pretty much everywhere you look, zombies! Zombies! ZOMBIES! From the Walking Dead to World War Z(ed)- they are among us and just waiting to rise and make life even more miserable. It’s been a long week- with a whole lot happening that has made for a whole lot of dis-ease. It’s Friday. This morning, as I walked to work, the first song to pop up on the Shuffle Daemon was one I wrote about a little over a year ago while feeling a little down and disenchanted. Interestingly, while I was on the fb last night, I noticed that Yusuf’s page had a post in the feed asking for best Yusuf/Cat memories. This is my fave of his songs (and boyohboy is it hard to choose a fave from his catalogue) and, like it always seems to do, it snapped me into a semblance of clarity. However long-lived or truncated that clarity might prove to be, it’s leading me into the weekend with some thoughts in my head and a song about positive energy in my heart. As my buddy Doobster noted- with his characteristic insight and ability to strike at the central point- on one of my posts a little while ago, ‘we’re all in the same boat and there’s no such thing as a hole in just one end’. The song encouraged me to have a very productive day- at work and, since I’ve been home, on some of the things that I’ve been neglecting lately. Enough wallowing. Time to grasp at the clarity and get back to contributing rather than complaining. It seems, lately, like I’ve strayed from the originally plotted course for this forum. I love the stories, don’t get me wrong. They are my life, so to speak, and they can do so much to help us heal this world. There is undeniable wisdom to be found within their characters and plots and ultimate messages and they deserve examination and re-contextualizing for our time and circumstances. Looking at our myths with new lenses can truly aid us in moving forward. Perhaps not repairing the injustices of history- that is beyond even the significant power of myth- but certainly helping to advise us when we are searching for the right way to proceed from here. Je sais, je sais. J’ai disparu. Encore en fois. a) I got caught up in an Ideas (that CBC again) presentation about Nietzsche. Yes, Nietzsche. Suddenly I’m back in the bookstore (yes, I still go to bookstores- fewer and further between though they may be) in order to re-visit his views on this world of ours (between him and Spinoza, I’ve spent a fair bit of time with philosopher-types of late). b) I woke up in the middle of the night (my 4 am awakenings have recurred- vengefully, it seems) with a fantastic idea (if I do say so myself) for a project regarding our perverse and self-destructive insistence upon living our lives according to apocalyptic thinking. An idea that jibed exactly with the Nietzsche and some of the books about positive corporate culture that I’ve been reading as part of my day job. c) While cruising the interworld (as I am sometimes wont to do) I became aware of a heinously misinformed group of women who think that #womenagainstfeminism is a real thing and a good thing- let alone an ideology that makes anything like rational sense. This was enough of a distraction- based in something like despair- that I felt the need to track it to its putative source(s) and read- and listen to (sitting in for Jian, Stephen Quinn spoke with Roxanne Gay- author of Bad Feminist- on Q today, and The Current had a discussion about ‘the movement’ on August 4)- a whole bunch of stuff about the ‘arguments’ against feminism that are appearing as poster-boarded memes. Memes that are dedicated to, and exemplars of, the sorts of things I discussed in my last couple of posts. Credulity, and how not knowing history leads one down the slippery slope of having it repeat itself. For example. d) My company’s Chief Morale Officer paid us a visit, and brought back to my mind something he said at a recent team culture meeting. It was about how having knowledge makes no difference if that knowledge isn’t shared. Zero. Zippo. Nada. It reminded me that I know stuff- and that I should be sharing the stuff I know. e) Mork left us all behind to return to Ork. So much has been said- so wonderfully and with such sincerity of loss (I won’t even address the ignorant, negative comments and despicable behaviours that are out there in the ether. Such things need no further dissemination or acknowledgement)- that I’m not sure I can add anything about his courage and kindness and gifts. And about how his celebrity and the genuine shock so many of us are feeling has opened (re-opened?) lines of dialogue about the insidious reality that is depression- and the stigma that remains attached to mental illness. While he brought us so very many enduring characters, I will never forget first meeting, while sitting in my parents’ bedroom, that red-clad charmer from another world. As he spoke with Richie Cunningham and then battled the Fonz (Fonzarelli thumb against Orkan finger), I felt like I’d found a new friend. Mork, with his innocent view of our world and his weekly explanations to his superior back home as he tried to make sense of it all, was profoundly resonant- and personally identifiable. On our yearly family holidays- which always involved extremely long car trips- as a way to entertain my wee sisters (and- as a side-effect- annoy the hell out of our parents- although that was an understanding I came to much later) I created a character of my own. This character was an alien- with, for some reason, a British accent- named YumYum. As we passed things of note- landmarks, cities, mountains, or listened to music (when it was our turn to control the tape deck), YumYum asked the sisters (named ‘Hi’ and ‘Bye’- my childhood imagination had significant gaps of inspiration, at times) to explain things as we drove along. In hotels, at the end of each long day, they taught YumYum to swim, talked about things that were on the tv and read each other books as a way of demonstrating the world to their own, personal, visitor from outer space. To say that YumYum was modeled on Mork is to state the veryvery obvious. Both aliens taught as they, themselves, learned. Robin’s subsequent roles built upon the innocence and wonder and joy with which his first great fictional incarnation viewed the world. He became a teacher (Dead Poets Society, Good Will Hunting)- and his lessons spoke volumes to the teacher in me. He played the archetypal little boy who never grew up- except that he somehow did grow up and forgot the lessons of his eternal childhood (until that scene when his Lost Boy straightens out the wrinkles and the extra facial padding and says, heartrendingly, ‘There you are, Peter’). She and another colleague are both learning to play the ukulele, and Izzy’s mash-up of Somewhere Over the Rainbow and What a Wonderful World was illustrative of this new undertaking- of branching outside of comfort zones and taking risks for the sake of trying something new. Izzy’s story- his talent, his pride in his home State, his status as a hero of Hawaiian rights, ideals and culture- make his loss (too young) all the more poignant. Taken from Don’t Worry About Me, Joey’s only solo album- released posthumously, it demonstrated his enduring spirit in the face of his fight with lymphoma. The world knew he was fighting- he battled his disease for seven years- but his death still came as a surprise. To me, anyway. I can remember exactly where I was when I heard he was gone (in a seminar class- Coptic language- my thesis adviser asked what I was listening to as I took my seat and removed my earlier-incarnation of the Shuffle Daemon. I happened to be listening to Rock ‘n’ Roll High School– and he told me that he’d just heard on the radio that Joey was gone…). When I watch that movie (at least once a year) or listen to any of his music, I still find it hard to take on board that he isn’t with us anymore. There’s another version of that song too. The first version. The one from 1967 performed by the great Louis Armstrong. The one that was used in a movie called Good Morning, Vietnam. My thoughts are all over the place, lately. Clarity is tricky to come by, and focus is lacking. Sorely. I’m, admittedly, scattered and, truth be told, more than a little shattered. So. I’m setting aside all that development of big ideas and sharable knowledge and the kvetching about the things that need changing. Tonight I’m just going to hold onto the conceit that our friend and teacher, Mork- and the man who brought him to life- has been recalled by Orson, once and for all. To join Izzy, and Joey and Louis. Na-nu na-nu, Captain, my Captain. Recently, I’ve been on something of a hiatus/sabbatical/terrible-and-extended-period-of-complete-and-total-writer’s-block. It wasn’t planned, and it has been hard to get back into my regular cole-like round of thinking and writing about the world around me. There are reasons for this. Some are practical- I write all day and, as a result, words have become sort of hard to access in my ‘leisure’ time; I’ve been fighting to ensure that insurance companies fulfill their contracted obligations and that lawyers are remaining on top of required procedures and such; I’ve been trying to catch up on some summer reading (too many books, not enough time); and (I have to admit) I’ve become a little hooked on Modern Family (HOW did I not watch that show before? Simple- and regretful- answer has to do with the fact that I was prejudiced against Al Bundy. BIG mistake. He’s great in this show. As are the rest of the cast and the talented writers who bring hilarious and touching family life to the small screen). Others are existential. I’m having a bit of trouble with the current state of this here planet of ours, and I keep having moments that tempt me to surrender my Human Race Membership Card. What the HELL is happening lately? Fellow humans, you are CHEESING. ME. OFF. (slight tangent- why ‘cheesing’? Cheese is good. I like cheese. A lot). There are too many fronts (and I use that word deliberately- what with warfare everywhere) on which we are refusing to act with the humanity I KNOW we can access. Choosing up sides- and responding atavistically out of emotional investment in the certainty that one perspective is the ONLY perspective worth entertaining. Can I resign? Or opt out? For a time, anyway. At least until some semblance of rationale is restored? Basically, I’ve been distracted. And neglectful. Maybe a little bit lazy. Living in Ignoresville– like the majority of us- rather than doing something about it all. Shouting into the wind about these things is draining- and the complete lack of effect is dispiriting, to say the least. But. Excuses are just that. Excuses. So. In a world gone crazy, I’ve been doing my very best to re-engage as best I can. And doing so has meant resorting to my default impulse- gathering as much information from as many perspectives as possible and reflecting upon my response to the input of others. I’m trying to get behind the headline ‘news’ and soundbite grand-standing to suss out origins and cause and effect and such-like-things. Among the things I’ve been tapping into most frequently are the myriad programs and documentaries that one can find on the CBC on any given day (at least until Harper’s Cons systematically destroy its greatness). Since it’s the summertime (according to the calendar at least- temperatures haven’t really been demonstrative of ‘summer’- here in my City by the Lake, anyway), CBC radio programs are rebroadcasting some really great shows- and many of them are linked by commonality of topical- and timely- theme. (Although there’s some pretty fantastic new stuff, too. Anyone catch Jian chatting with Mr. Tom Petty a couple o’ weeks back? Jebus. THAT was a great interview. I might have to say more about that sometime in future- assuming I maintain this limited ability of stringing words together). 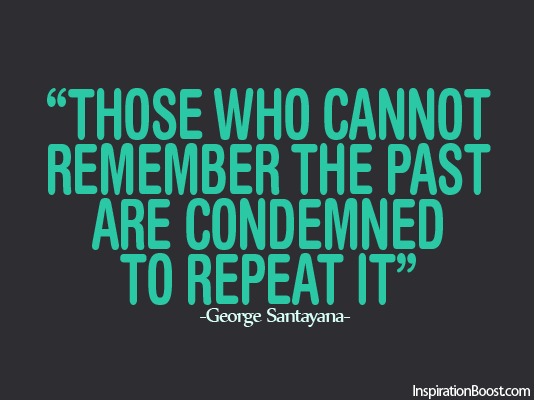 After listening to a diversity of shows, I’ve come to the conclusion that best summation of our current messes- at home and internationally- boils down to that old salt, most famously articulated by the poet/philosopher George Santayana. I’d go even further. Those who refuse to take the time and effort to learn about the past don’t have clue one how to handle the present and future. Among the most poignant commentaries that reinforce this analytic truth (as I assess such things) was an episode of The Current that featured and interview with Scott Anderson about his book Lawrence in Arabia: War, Deceit, Imperial Folly and the Making of the Modern Middle East (which has now been bumped to the top of my summer reading list). Synopsis? Anderson illustrates that since the period before WWI, the West just keeps on blundering into a region of the world about which we have zero understanding. The colonial ideal- as dictated and perpetuated by arrogance and drive for economic, political and religious power- set the groundwork for the percussive events that continue to ripple, violently, through the region and beyond. On a connected theme, Ideas had a two-part documentary called ‘The Chosen’, talking about the concept and its origins in Bronze Age ideology and mythology, and how it has continued to shape belief and political motivations since. It made me angry. Things like ‘Sense of Mission’ (that proselytizing to the ‘ignorant’ of other lands/cultures is not only acceptable, but MANDATED and supported by the ruling powers- religious AND political), the ‘Doctrine of Discovery’ and ‘Manifest Destiny’ stem out of the variety of ways in which the biblical conceptualization of ‘Chosen-ness’ have been interpreted over the ages. It supports our narratives of violent conquest. Things like Divine Providence and Blessed Partisanship. The imposed authority of the Pope and the secular governments (under things like the ‘Divine Right of Kings’) granted ‘authority’ over all non-Xian peoples. Despite the fact that this Western-centric interpretation of the concept has been discussed and disputed for centuries- notably and quite wonderfully by the 17th century philosopher, Baruch/Benedict Spinoza, who maintained that the there was no such thing as ‘eternal’ Chosen-ness- it persists in our conceptualization of the ‘right order’ of things. Spinoza’s idea of god was one that is abstract and impersonal- and therefore equally indifferent to all people, regardless of tribal/religious/political affiliation. To him, being the Chosen of this god was something that is experiential and socially constructed- and therefore subject to change outside of its originating historical/geographical/temporal context. I like Spinoza’s thinking (he also wrote about good and evil as relative concepts. The dude had it going on). Thematically linked, these two great programs speak to the origins of one of the acts of insanity that is happening right now. Just one. And it’s one about which I tend to speak with heightened awareness of the volatility of the subject matter. Another, recent, episode of The Current spoke about the media-handling of the current conflict- and whether or not there are biases at play that make it impossible to develop a clear picture of what is actually happening. Everything about the situation leads to contention and accusations against those who hold differing opinions. I won’t share mine. I don’t, as a rule, discuss the politics of this particular region. There is generally too much emotional investment at play- and that emotion is all-too-frequently sourced in something other than a complete understanding of the history of the region. I don’t claim to have anything like a complete understanding of the history of the region, but mine is certainly more comprehensive than most. And I don’t see an end. I can’t see an end. Not when all sides (and there are far more than just two sides in this conflict) base their claims and perspectives in ideological constructs that have no place in a civilized, humanistic world. 1) Why is someone looking to get rid of a Mesopotamian demon? 2) What, content-wise, in any of my posts, might lead a search engine to think that I am offering advice on how to get Pazuzu gone? 3) Who, other than students of Ancient Near Eastern mythology and/or super-fans of The Exorcist franchise even knows who Pazuzu might be? Side note: I quite like Pazuzu- he’s a pretty groovy fictional personification of evil- pretty high up there in the pantheon of cool demons- and I’m not sure why he needs to be exorcised. If, in this case, we look to Pazuzu- an Assyrian/Babylonian demon king- as an example of the metaphorical personification of things that humans found troubling at one point in time (to the Mesopotamians he embodied the southwestern wind that brought storms/locusts and drought/famine to the area), as the metaphorical personification of something I find troubling in this time (the imposition of outsider mores/values/beliefs without understanding of the indigenous order of things), I’m all for getting him exorcised the hell outta here. But, like all things that stem from those worldviews that originate in the Ancient Near East, it’s never that cut-and-dried. The foundational dichotomy of the area wasn’t based in relative good and evil (as people like Spinoza describe it) but in order and chaos- and tools of chaos were often used to prevent the onslaught of MORE chaos. In addition to being feared as the bringer of the foul southwest wind, Pazuzu was also invoked to combat the power of his rival goddess- Lamashtu. He is a force of chaos, but as the king among demons he is useful to humanity as a protector against other, different, evils. Lesser of two evils, indeed. Although he was, in fact, the greater of a whole bunch of evils- as far as the pantheons of such superstitions organized these things. So perhaps he- and all his ilk- do need exorcising, after all. I keep thinking about one of my Mum’s favourite adages: Two wrongs don’t make a right. Fighting wrong by doing wrong- and using the tools of ‘evil’- is never the right thing to do. Something to keep in mind, regardless of which side of any particular conflict in which you might be ideologically and/or emotionally invested. It’s the beginning of the August long weekend/Civic Holiday- ‘Simcoe Day’, here in TO. The Caribbean Festival is in full swing, demonstrating, as it does every year, the strong multicultural community about which we can be proud- while we remind ourselves how fortunate we are to live in a place where ideological differences can, generally, be resolved without violence. A little optimism- and music- is therefore in order. U2. A tune about different sides standing together, inspired by the Polish solidarity movement. Shows fear as he turns to hide. We fade to grey. In times of fear and uncertainty we have a tendency to slip into grey areas- that can lead to actions that reflect the darkness of our human nature and end up desensitizing us to the bombardment of bad news that is everywhere. It becomes hard to find perspective and embrace the good stuff that continues to happen in spite of the terror and hatred that stem from adherence to ideologies that promote separation and ascendency of one side to the detriment and destruction of others. Ideologies that are followed, blindly, without any awareness of origin or the political maneuvering that has kept them on our collective human radar. That lack of awareness is causing anomie and existential separation and is crippling all us citizens of the world. To build a wall between us- We know they won’t win. We’re all in this together. Happy Long Weekend, Peeps!